Cystic hygroma was first described in 1828 by Radenbacher. Cystic hygroma (meaning "moist tumor") belongs to a group of diseases now recognized as lymphatic malformations. In cystic hygroma (shown in the ultrasonograms below), cavernous lymphatic spaces communicate and grow to form large cysts that can infiltrate the surrounding tissue. Cystic hygromas can be discovered before birth or in the neonatal period. Occasionally, the cystic hygroma may not be discovered until the patient is older. Oblique longitudinal ultrasonogram obtained through the fetal head and thorax. The red arrowindicates cystic hygroma. Note the normal pocket of amniotic fluid. 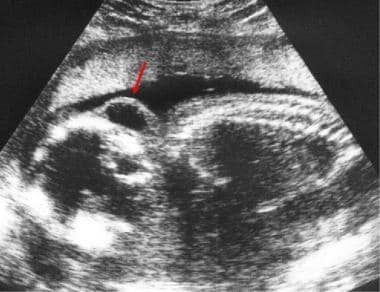 Normal nuchal translucency (red arrow) on a sagittal section in a fetus. The amniotic membrane is depicted separately (green arrow). 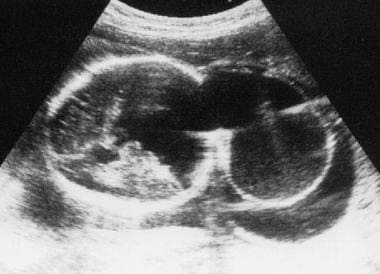 Oblique transverse ultrasonogram of the fetal skull shows posterior cystic hygroma (same patient as in previous image). Ultrasonography (US) is the modality of choice for diagnosing fetal cystic hygromas. US is readily available and noninvasive, and it is used extensively in pregnancy for fetal monitoring and diagnosis. Fetal positioning, maternal body habitus, and operator dependence can make the diagnosis of cystic hygroma with US difficult at times. 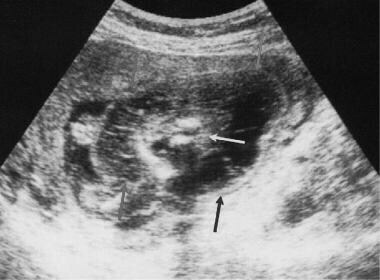 [3, 4, 5] Moreover, the diagnosis can be missed, even with large fetal cystic hygromas, when severe oligohydramnios is present; the hygromas can be mistaken for pockets of amniotic fluid (as demonstrated in the image below). Ultrasonogram shows a massive posterior cystic hygroma (red arrows) behind the thorax (blue arrows). Image illustrates the potential for mistaking hygromas for pockets of amniotic fluid. Note the internal septa. The green arrowindicates the spine. Computed tomography (CT) scanning uses ionizing radiation and is contraindicated in pregnancy unless overriding considerations are involved. Plain radiography also uses ionizing radiation and is contraindicated. Moreover, the findings from plain radiographs are not helpful; cystic hygroma affects the soft tissue, so the images are unlikely to have good contrast. As previously mentioned, plain radiography is typically not used, because it employs ionizing radiation and because it cannot depict the internal contents of the soft-tissue mass in the neck. CT scanning is avoided because it employs ionizing radiation. However, if the reasons to use CT scanning are overwhelming, the extent of pathology can be assessed with this modality. The long acquisition times inherent in most MRI acquisition sequences make the use of MRI impractical unless special fast sequences are performed. In optimal settings, MRI can provide exquisite anatomic detail, and it can be especially helpful in identifying additional pathology, as well as in determining the extent of the disease. Gadolinium-based contrast agents have been linked to the development of nephrogenic systemic fibrosis (NSF) or nephrogenic fibrosing dermopathy (NFD). For more information, see the eMedicine topic Nephrogenic Systemic Fibrosis. NSF/NFD has occurred in patients with moderate to end-stage renal disease after being given a gadolinium-based contrast agent to enhance MRI or magnetic resonance angiography (MRA) scans. NSF/NFD is a debilitating and sometimes fatal disease. Characteristics include red or dark patches on the skin; burning, itching, swelling, hardening, and tightening of the skin; yellow spots on the whites of the eyes; joint stiffness with trouble moving or straightening the arms, hands, legs, or feet; pain deep in the hip bones or ribs; and muscle weakness. For more information, see Medscape. Although a hemangioma can appear similar to a cystic hygroma, the hemangioma usually is found in a different location, and after contrast is administered, feeding vessels may be seen, in addition to tumor enhancement. It has been suggested that the prenatal diagnosis of cystic hygromas is particularly aided by transvaginal US. In fact, the condition is most often diagnosed by using prenatal US, and the findings can be striking and unmistakable. 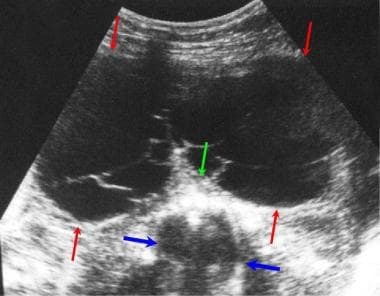 The ultrasonographic characteristics of cystic hygromas are demonstrated in the images below. 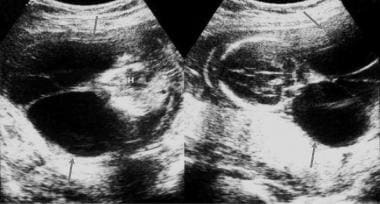 Longitudinal ultrasonogram through the fetal head and thorax shows huge cystic hygromas extending to the top of the skull (arrows). The classic finding in cystic hygroma is a cystic mass with multiple septa (see the image below) that appears as multiple, asymmetrical, thin-walled cysts related to the posterior aspect of the neck. These masses are associated with aneuploidy. 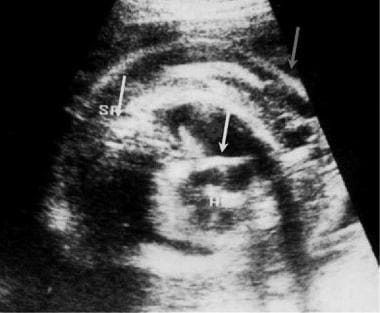 Transverse ultrasonogram of the thorax in a fetus with hydrops. Note the thickened skin and subcutaneous tissue with multiple small cystic spaces. A fetal pleural collection is noted. Transverse ultrasonogram through the fetal neck shows posterior cystic hygromas extending around the neck to the anterior aspect. Ultrasonograms show large posterior cystic hygromas (arrows) behind the thorax on the left and the skull on the right. Note the nuchal ligament extending backwards from the spine in both images. H indicates the heart. US remains an operator-dependent modality and must be performed by a trained individual who is skilled in evaluating fetal anomalies. A thorough fetal examination results in a high confidence level. Most often, US is the only technique that is necessary for prenatal diagnosis. 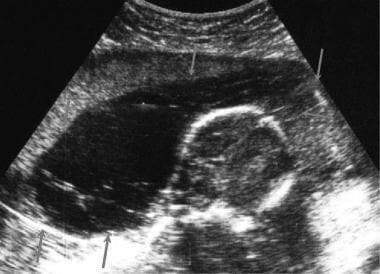 Fetal cystic hygromas should be differentiated from posterior encephaloceles (demonstrated in the image below), in which an underlying skull defect is present, and from cervical myelomeningoceles, in which an underlying vertebral defect is present. Large, posterior encephalocele. Note the underlying skull defect demonstrated on this ultrasonogram in a fetus with cystic hygroma. As previously mentioned, the diagnosis of cystic hygroma can be missed, even with large fetal cystic hygromas, when severe oligohydramnios is present; the hygromas can be mistaken for pockets of amniotic fluid (as demonstrated in the image below). A common artifact is caused by the presence of loops of umbilical cord near the cervical spine of the fetus. On occasion, these loops can simulate cervical cysts. A Doppler US evaluation demonstrates characteristic umbilical flow signals from this area. Fetal cystic hygroma must also be differentiated from other neck masses and cysts, such as anterior cystic hygromas, goiters, and cervical teratomas. Compared with other masses, purely anterior cystic masses in the fetal neck have a different and better prognosis, and many resolve spontaneously. Graesslin O, Derniaux E, Alanio E, et al. Characteristics and outcome of fetal cystic hygroma diagnosed in the first trimester. Acta Obstet Gynecol Scand. 2007. 86(12):1442-6. [Medline]. Chervenak FA, Isaacson G, Blakemore KJ, et al. Fetal cystic hygroma. Cause and natural history. N Engl J Med. 1983 Oct 6. 309(14):822-5. [Medline]. George R, Shah R, Bulas D, Kline S, Alexander S, Reilly BK. The delivered promise of prenatal imaging and a challenge to the utility of sildenafil for severe lymphatic malformations. Int J Pediatr Otorhinolaryngol. 2015 Feb. 79 (2):89-93. [Medline]. Gan RW, Chauhan K, Singh S. Spontaneous resolution of a recurrent axillary cystic hygroma following acute infection. BMJ Case Rep. 2015 Nov 9. 2015:[Medline]. Derin S, Şahan M, Dere Y, Çullu N, Şahan L. Cervical cystic hygroma in an adult. Case Rep Pathol. 2014. 2014:209427. [Medline]. Rasidaki M, Sifakis S, Vardaki E, et al. 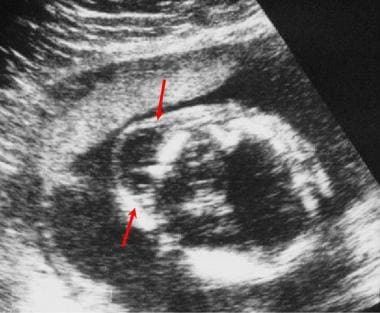 Prenatal diagnosis of a fetal chest wall cystic lymphangioma using ultrasonography and MRI: a case report with literature review. Fetal Diagn Ther. 2005 Nov-Dec;. 20(6):504-7. [Medline]. Mota R, Ramalho C, Monteiro J, et al. 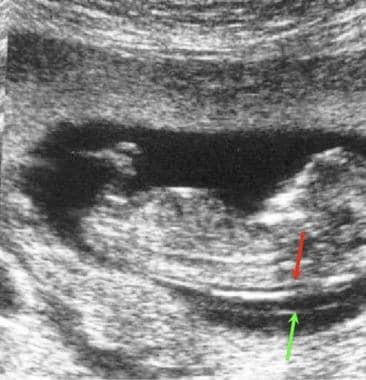 Evolving indications for the EXIT procedure: the usefulness of combining ultrasound and fetal MRI. Fetal Diagn Ther. 2007. 22(2):107-11. [Medline]. Estroff JA. Nuchal translucency in Turner syndrome. Cohen HL, Sivit CJ, eds. Fetal and Pediatric Ultrasound. New York, NY: McGraw-Hill; 2001. 36-8. Cohen HL. Ascites and pleural effusion in hydrops. Cohen HL, Sivit CJ, eds. Fetal and Pediatric Ultrasound. New York, NY: McGraw-Hill; 2001. 79-82. Coronal ultrasonogram of a fetal thorax showing axillary cystic hygromas (arrow) and the heart.